The blog of the Pabellón de la República, at the University of Barcelona, just announced the catalogization of a stunning collection of 4,500 photographs shot between 1934 and 1938 by legendary photographer Agustí Centelles, collected in a 133-page scrapbook assembled in the late 1970s by the photographer himself, for the purpose of establishing his copyright of the images in question. 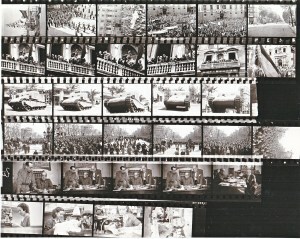 In 2009 the Centelles family sold the photographer’s archive of prints and negatives to the Spanish Ministry of Culture, to the frustration of the autonomous Catalan government; among the prints was the portrait of a young International Brigader whom ALBA was able to identify as an Afro-Cuban volunteer who left from New York in 1937. See full Volunteer coverage here.